Driving away from our great time exploring the Willis Creek Slot Canyon we turned Southeast on Cottonwood Canyon Road just to head “thataway” and see what we might find. 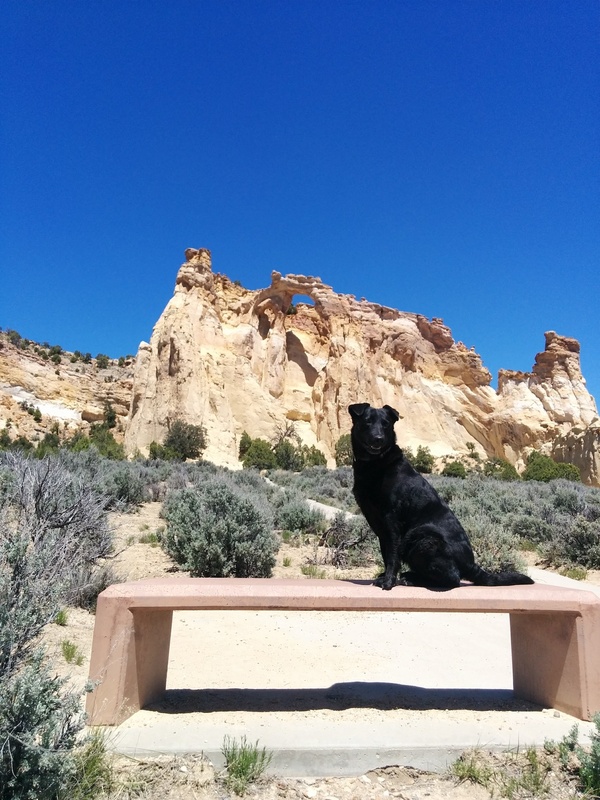 A little more than 4 miles later we came to the turnoff to Kodachrome Basin State Park. We initially turn up that road and then quickly changed our mind both because of the crap washboard road we were just not in the mood for after our earlier exertions and because, as a Utah State Park our Federal Interagency Access Pass would be useless and we would have to pay to see a bit more of what we had already seen so much of in the past couple of days. Our frugal side won out and we turn left back onto Cottonwood Canyon Road just as it turns into a dirt road. About 10 miles on a fun dirt/sand road and we almost drove past an invisible road turning off to the left. We had no idea what was here but as we backed up we could read the brown sign with white lettering which told us Grosvenor Arch was just up that road. So…adventure! We turned left up the sandy road that heads the last half mile up to the Grosvenor Arch parking and day use picnic area. The small parking area was 3/4 full with ATVers just about to leave. We found an open spot and parked. Next to the vault toilet are 4 picnic tables in an unshaded little fenced corral. The trail up to the arch itself is all of a couple hundred yards of a nice concrete path with a slight incline. We’re calling this completely wheelchair accessible. 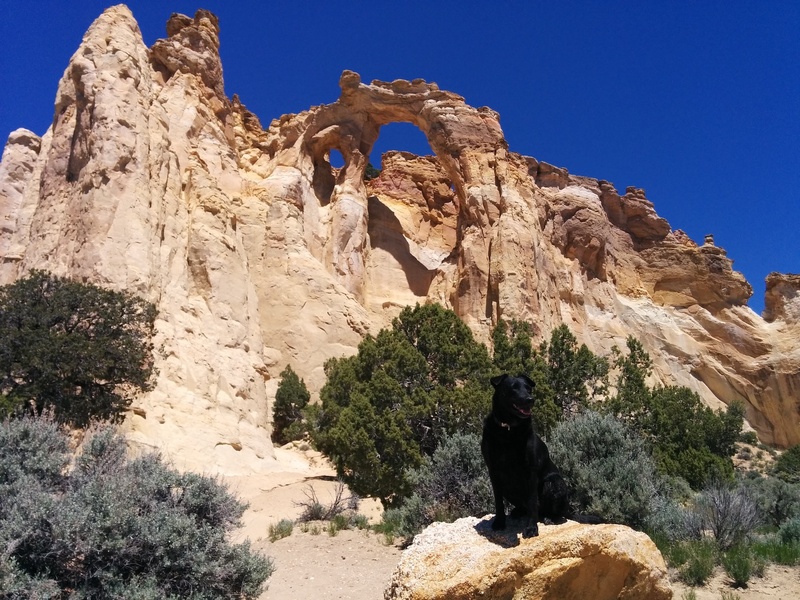 Halfway up the path was a concrete bench and I got Willow to hop on up for a establishing shot where you can just begin to see the unique structure of this double arch. 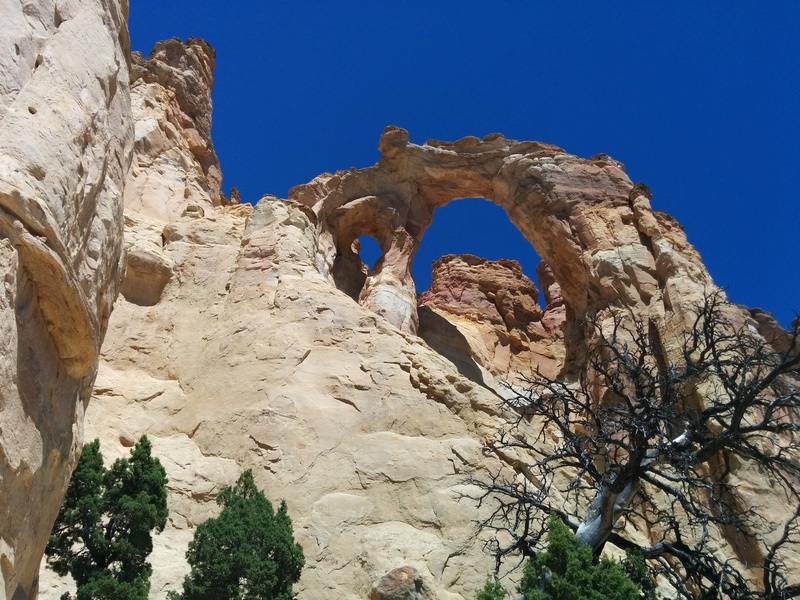 Located somewhat near the center of the Grand Staircase-Escalante National Monument in Northern Kane County this is also one of the Monuments which is on President Trump’s ill-conceived “hit list” of Federal Lands he wants to turn over to the highest corporate bidder. We hope and expect he will fail in this attempt. 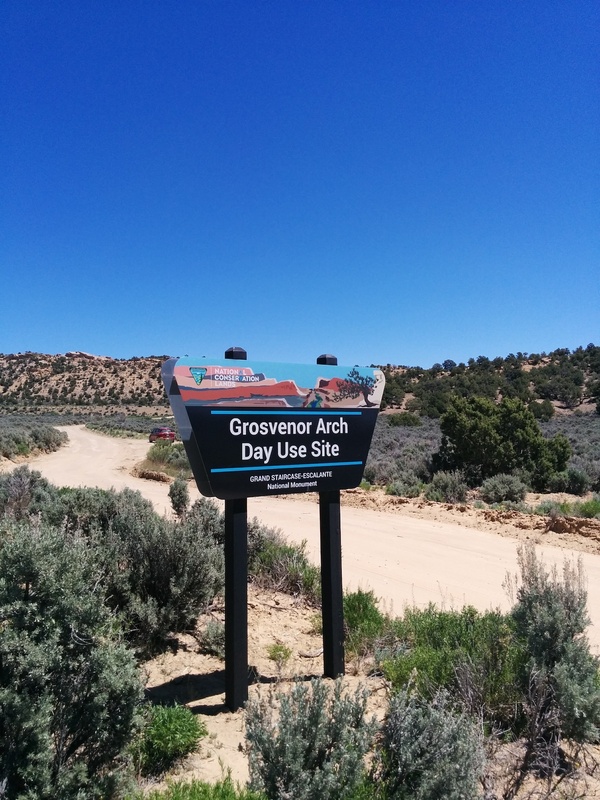 Grosvenor Arch is actually two sandstone arches 150 feet (45 meters) above the ground. The largest arch is nearly 100 ft (30 m) in diameter. Originally named Butler Arch by early settlers in the area the arch was later renamed in 1947 by a National Geographic Society Expedition for their founder and first full-time editor of their iconic magazine, Dr. Gilbert Grosvenor. Hopping off the bench we continued on up the path via another minute of walking before we came to our next picture spot. Coming in the way we did from Willis Creek the drive was pretty easy and all of 17 miles long. When we headed away from the Arch we encountered several vehicles, not all of them suitable transportation choices for these conditions, coming up the road from the South. You could see the faces and tell that those drivers and passengers in a rental Toyota Camry, Honda Civic, Chevy Cruze or the like (yes, we saw all of those) were less than happy with the rough, bouncy and dusty situation they now found themselves in. So, FYI: If you come up from Hwy 89 on that end of Cottonwood Canyon Road you’ll travel over 30 miles on variable-surfaced dirt and rock roads. Your easiest bet in coming in from the North. So you see, when on an adventure where you are not really sure of what you will find or what the outcome will be you sometimes fortuitously come across a worthy find such as this. Still not completely content though with our explorations of the day so far we pushed on to our last “destination” spot of the day, Horseshoe Bend. Happy Trails To You Too.